Dinner last night was a prawn curry, cooked by my mum, but I offered to have a go at making naan breads to accompany this. I’d idly considered making them before but this seemed like the perfect opportunity as I could concentrate on them and not have to worry about doing the curry to go with them. So dinner was a bit of a collaborative effort last night. 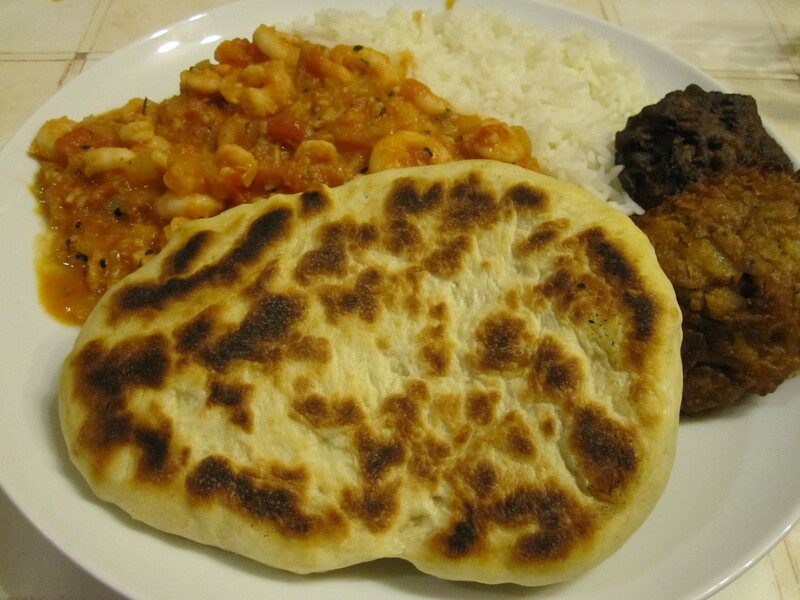 I am happy to say that, after I’d made the first few, naan breads were easy and absolutely delicious! Naan bread is like pancakes, the first one or two are a bit rubbish but once you get the right level of fat then you’re away! Next time I will know exactly what to do and, I hope, anyone trying this recipe themselves will benefit from my experimentation. Ghee is the only odd ingredient here, if you can’t find it then just use butter and you’ll be fine. I’ve seen it in major supermarkets and smaller indian/asian shops too. – In a large bowl mix together the flour, salt, baking powder, yeast and sugar. – In a jug beat together the yogurt, egg and oil. – Make a well in the centre of the dry ingredients and add the milk and the yogurt mixture. – Use a wooden spoon to mix together the ingredients until it forms a smooth dough, if it seems a bit sticky add more flour. – Turn out onto a floured worksurface and knead for 10 minutes, until smooth and soft. – Oil a bowl and place the dough in the bowl, lightly oiling it too. – Cover with a damp teatowel and leave to rise in a warm, draft free place for 1 hour or until doubled in size. – Knock down the dough and turn it out onto a worksurface. – Knead a little and roll out into a long saussage. – Divide into 9 equal portions. Roll these into balls. – Keep the balls covered by the damp teatowel while you work with the dough. – Heat a cast iron pan, with a lid, on the hob on a medium heat, you want it to be hot but not burn. – Brush the bottom of the pan with melted ghee. It should spit and bubble but not smoke. – Roll out one portion of dough into an oval, aim for the classic naan teardrop shape if you can. – Slap the shaped dough into the pan and press it our a bit with your fingers. – Put the lid on the pan and leave it for 2 minutes. – Take the lid off and brush the top side of the naan with melted ghee then flip over and cook for a further minute with the lid on. – Take out of the pan and cover with a teatowel to keep warm. – Repeat the process with each of your portions of dough. If you have a bigger pan than me then you could easily do 2 naan at once. – Serve warm with your favourite curry. I love Marshmallow Crispies, they’re one of the first things I ever made as a kid and I’m just as fond of them now as an adult. There is this bakery near us where you can get a block of it the size of half a brick! It’s also a quick and tasty treat to throw together. Yes, it does involve melting sugary things, so there’s an element of risk if you set a kid loose on it, but I never managed to hurt myself and I’ve been making them for nigh on 20 years now! 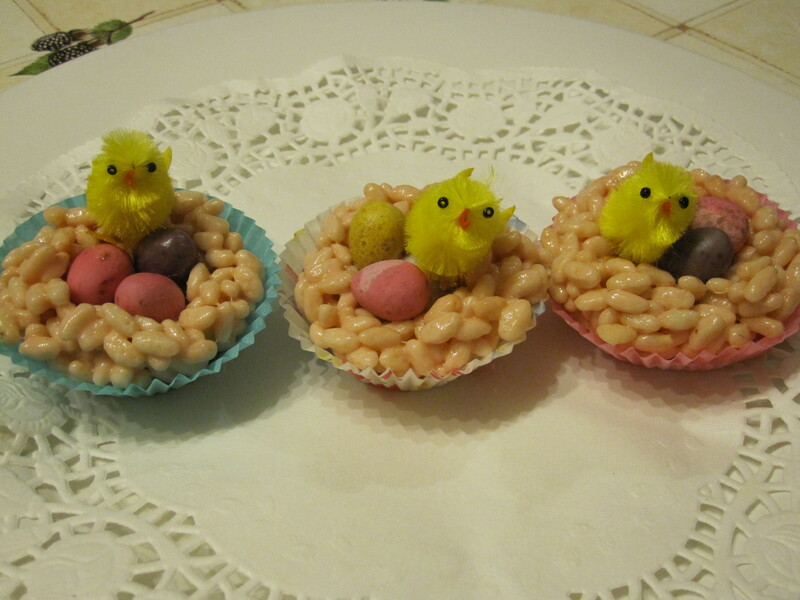 I decided that since Easter is fast approaching nests were the way to go. 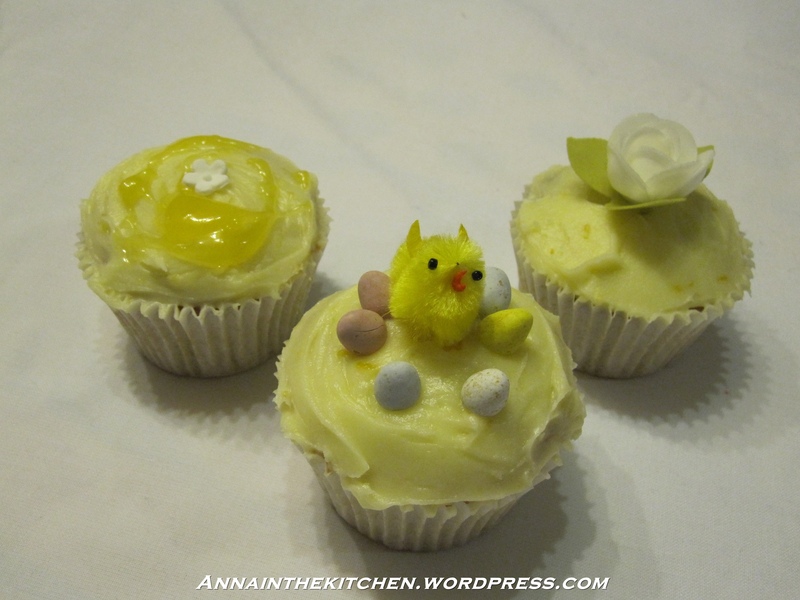 I’m not sure that the chicks were the best plan… although I’m sure yellow fluff will taste great covered in marshmallow! These are sticky though. If you’re just pressing it into a tin it’s bad enough but getting your hands involved to shape nests is tricky! Vegetable oil is the key here, lots and lots of oil! – Oil 2 bun tins (I have a 12 and a 9). – In a large pan melt the butter over a low heat. – Add the marshmallows and heat very gently until the marshmallow melts too. Keep stiring as you don’t want it to burn and stick. – Add the vanilla essence and stir through. – Once completely melted take off the heat. – Add the rice crispies and stir until well coated. – Lightly oil a metal spoon and well oil your hands. – Use the spoon and your hands to scoop a heap of marshmallow crispie into the holes and shape with your fingers. 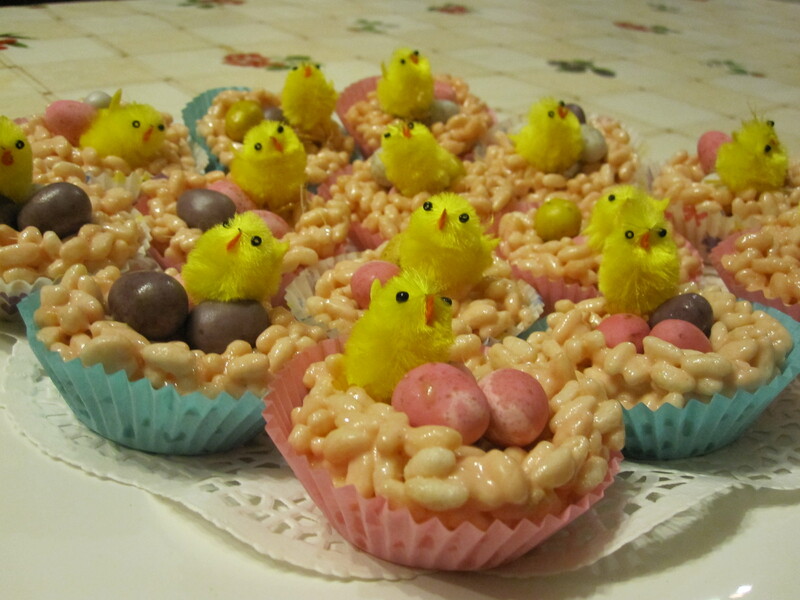 – Add the mini eggs and chicks to each one as you finish so they will stick. – Continue until you run out of mixture. – Leave to set in the tins for 1 hour then run a knife round the outside to loosen. – Place each treat in a paper bun case to serve* and prevent sticky fingers! * If you just put the mixture straight into the case it will stick to the case and you eat a lot of paper. This way it sticks a lot less so you don’t have to increase your fibre intake so much! I was going to pick up a “tear-and-share” bread from the supermarket on my way home tonight but I wasn’t feeling that great and really couldn’t be bothered to brave the hoards so I came straight home instead. However, on my way home I realised, I could make tear-and-share bread! I could also make tear-and-share bread better! I always feel that, great as it is, the supermarket stuff can be rather dry, so mine is delicious and moist, I also added mozzerella cheese to it as well to give it even more deliciousness. I am happy to say that something I invented in the car on the way between the station and home turned out perfectly. Even better, I managed to make bread in the time between getting home and dinner, an hour and 3/4, all in all I’d call this bread a triumph! My photo’s, however, are not. I apologise for the shoddy photography but I was starving hungry and only just remembered to take pictures at all! – In a large bowl mix together your flour, yeast and salt. – Turn out onto a work surface and knead for 5-10 minutes until the dough is smooth and supple. – Melt together your butter and garlic in a small bowl. – Chop the mozzerella into small chunks. – Turn out and lightly knead the dough for a minute then pinch small, walnut sized chunks of dough off and roll them into balls. – Drop a few (half a dozen or so) balls into the butter then fish them out with a spoon put them into the loaf tin to form a loose layer. – Once you have a rough layer over the bottom of the tin sprinkle over half the mozzerella and grate over half the cheese. – Continue to ball up, dip and place your dough balls in the tin until you have a second layer. – Sprinkle over the remaining mozzerella and grate over the rest of the cheese. – Drizzle over any remaining butter. – Leave to rest in a warm/hot place for 10-20 minutes. – Bake in the oven for 20-25 minutes. It will rise up, go brown on the tips and bubble away nicely. – Serve fresh from the oven but beware of the hot butter that will drip everywhere! * I used 100g butter but when I took it out of the tin butter went all over the place I would say use 75g. It’ll still be moist but you might not get melted butter all over the floor! Up until yesterday I wasn’t too sure what lemon curd actually was. 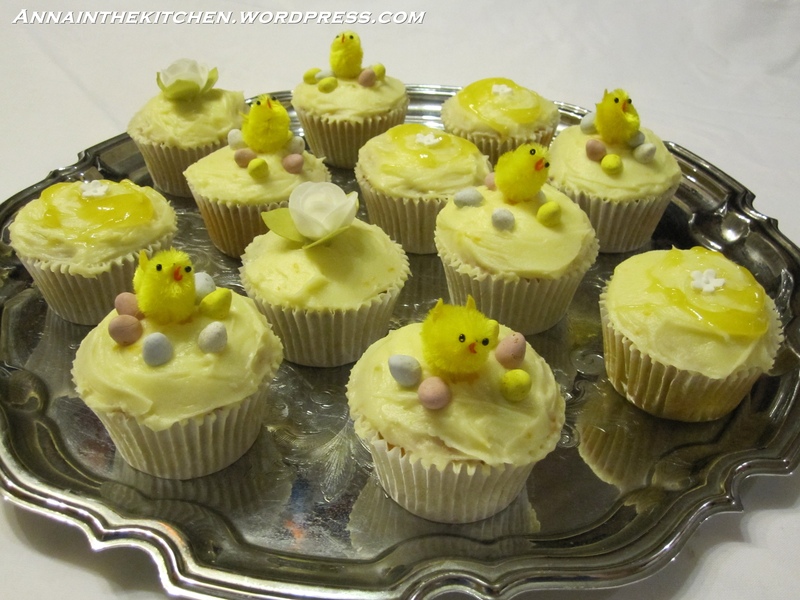 I just knew my mum liked it and so I set about making Lemon Curd Cupcakes for her for Mothers’ Day. Turns out lemon curd is delicious! I love the tangy sweetness of it, the sharpness of the lemon means it’s not too sweet to simply enjoy from the spoon, for instance! I thought it made a lovely, perky and refreshing cupcake. The key cuteness with these cupcakes it, of course the decorations. I went on a bit of a drunken internet shopping expedition last month and as a result I now have a bunch of really cute decorations I would normally have deemed far too expensive. Thank god for Prosecco! The chicks and eggs were actually not expensive at all. I got a box of 50 chicks from the pound shop in town and the bag of miniature chocolate eggs came from Tesco. The chicks are everywhere right now and even if you can’t find these utterly adorable mini-mini eggs then larger ones will look great too. – Heat the oven to gas mark 4 and line a 12 hole muffin tin (and 1 ramekin dish for the extra) with paper cases. – Gradually beat in the egg a bit at a time until thoroughly combined. – Add most of the lemon zest (about 3/4) andf mix until well distributed. – Sift in the flour and fold until just combined. – Divide the mixture equally between the cases. – Bake for 25 mins. – Remove from the oven and allow to cool in the tin for 10 minutes then remove to a wire rack to cool completely. – Meanwhile cream together the butter and icing sugar. – Add the milk, remaining lemon zest and 2 tbsp of the lemon curd. – Mix until smooth and creamy. – When the cupcakes are cool use a paring knife to cut a small circle in the centre of the cake and then remove the core. – Slice the top off the core and keep, dispose of the middle bit of cake. – Place a spoon of lemon curd in the hole and then put the cap of the core back on to fill the hole. – Carefully spread the buttercream on the cupcakes so as not to disturb the cap. – Decorate as you wish. I drizzled lemon curd over as well as usuing the chicks and flowers for a hint of a different texture. 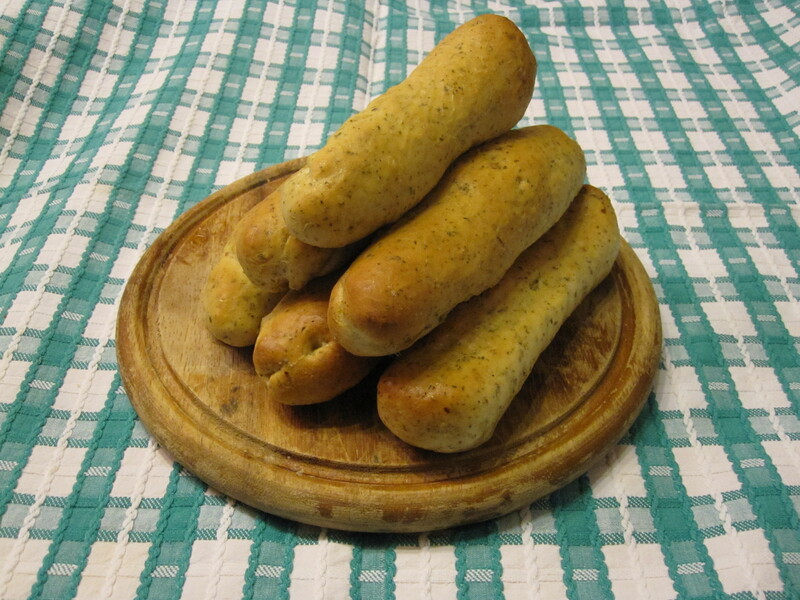 I saw an article about soft bread sticks over on The Kitchn and I was intrigued. I only knew about the regular crunchy kind. I don’t know how authentic or otherwise this recipe may be but I’m happy with it. 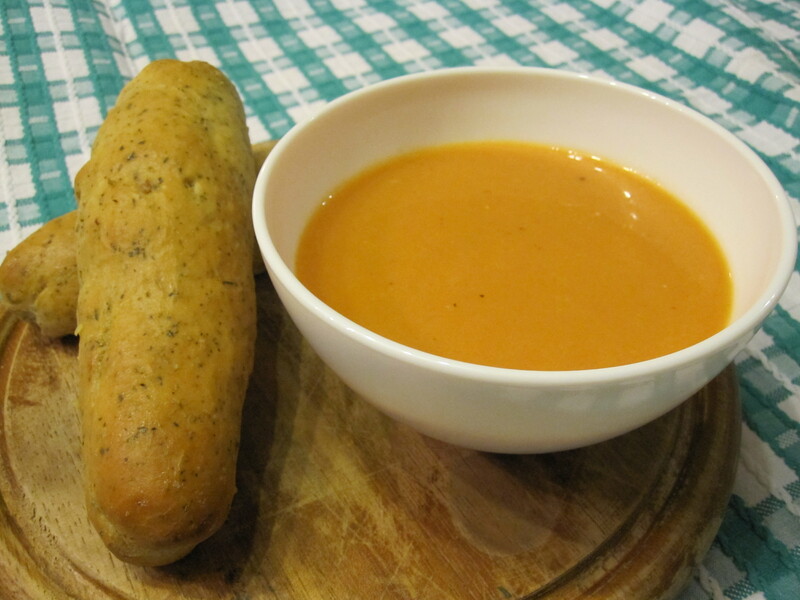 Essentially this is just a long, thin, soft roll but they’re perfect for dipping in soup, which is how I had mine. I got the impression they’re commonly used for dipping is saucy things like pasta dishes too. 2 cloves garlic, finely chopped or crushed. 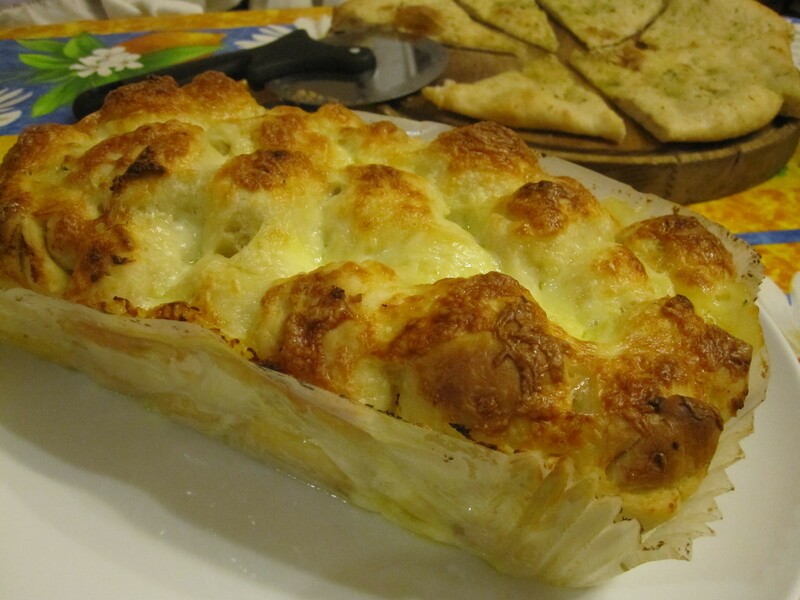 – In a large mixing bowl mix together the flour, yeast, salt, herbs and garlic. – Mix until it comes together as a dough. – Heat the oven to gas mark 8 and line 2 baking trays. – Knock down the dough and lightly knead for a minute. – Press into a rough rectangle and cut into 12 strips. – Gently roll to shape each strip and place on the baking trays at least 1 inch apart. – Leave on the tray for 20-30 minutes until they look puffy. – Bake for 15-20 minutes until browning on top and the underneath sounds hollow when tapped. – While they are baking melt the butter and garlic in a small bowl in the microwave. – When you take the sticks out of the oven immediately brush the tops with the melted butter. 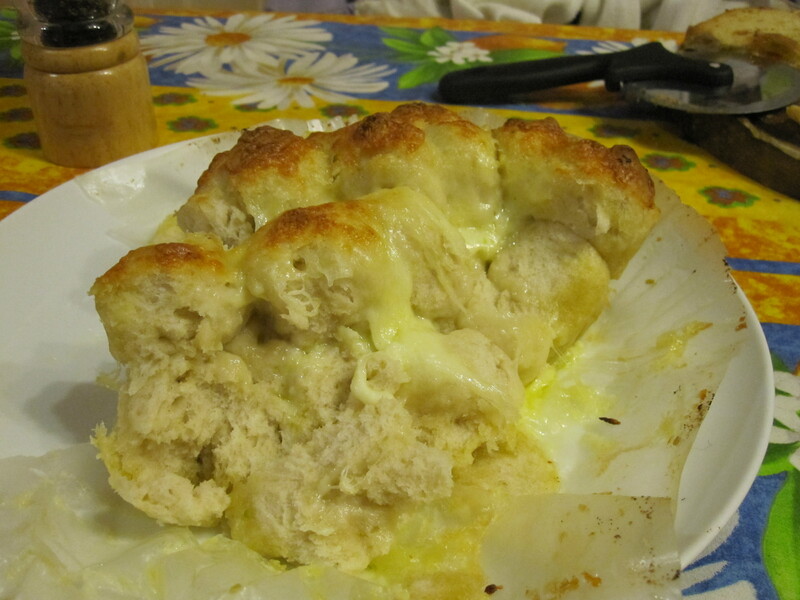 – Leave to cool slightly and absorb the butter to give soft tops. – Enjoy with soup or other delicious dippy things. I love tomato soup made from fresh tomatoes in the summer and somewhere about I saw the idea for tomato soup made using tinned tomatoes. In the depths of winter, although spring seems to be trying, I often feel that there’s just no point in buying tasteless, watery, tough tomatoes shipped in from god knows where but a bowl of comforting tomato soup can be just the thing. A tin of Heinz has its place but sometimes you want to make things yourself. This is quick, simple to throw together and I think that just about everyone will have the ingredients in their storecupboard essentials. I threw this together for my lunch tomorrow. I’m having it with my new recipe for Soft Bread Sticks. – Heat a splash of oil and a knob of butter in a medium sized pan until just bubbling. – Add the onion, garlic and a pinch of salt and fry gently until soft. – Add the tomatoes and stock. – Stir well and bring to a simmer then remove from the heat. – Add the creme fraiche and then use a stick blender to blend until smooth. 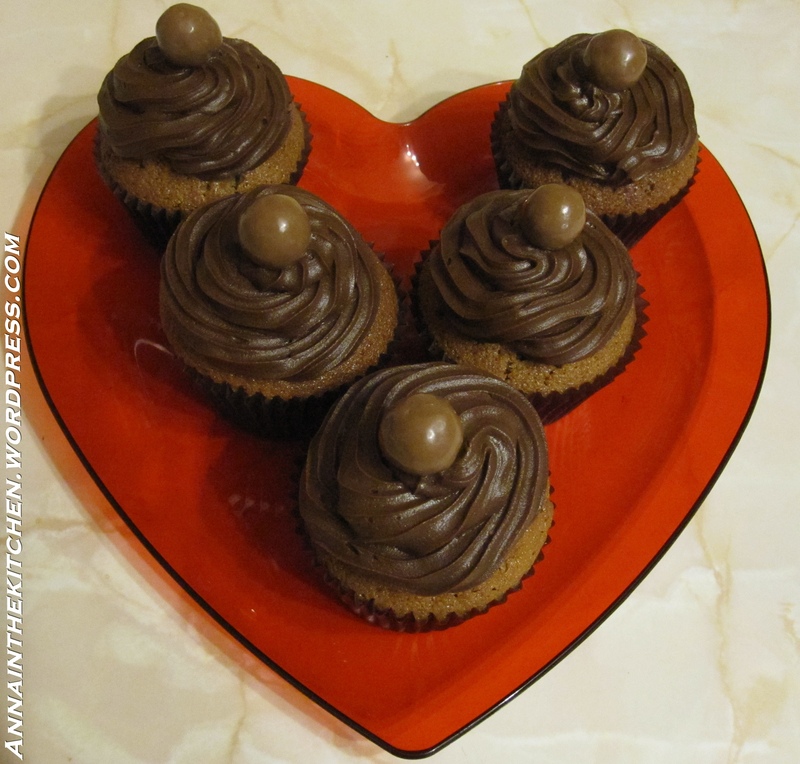 I have been playing about with the idea of malted cupcakes for a while now. 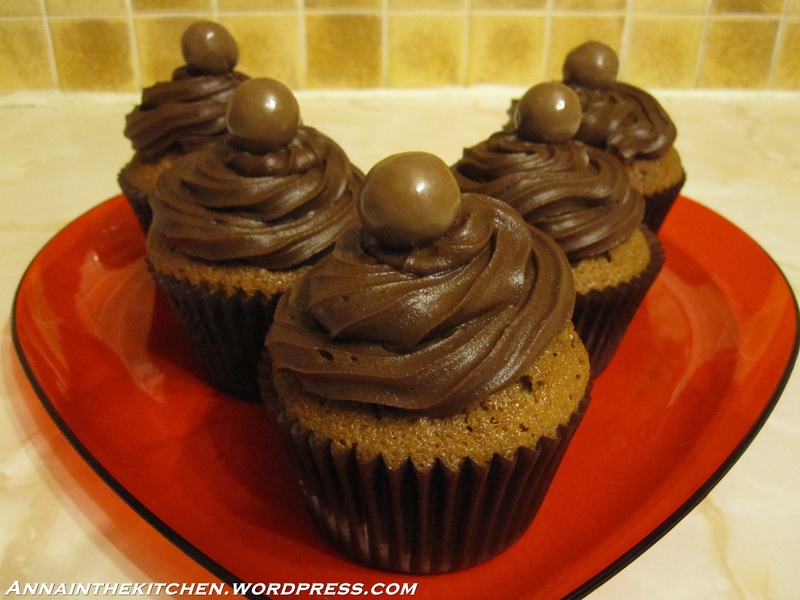 I adore Maltersers and Ovaltine and the combination of Malt and Chocolate seemed crying out for a cupcake variation! I probably could have just googled and had a few recipes at my fingertips but I decided to go my own way with this challenge and see what I could come up with on my own. I only made a half batch to see how they would turn out but I’ve given the recipe for the full dozen here. I made a few alterations to my usual cupcake recipe and I think it’s a very pleasant result. I’m not doing cartwheels over it yet, I think I’d like to get them a bit maltier for my own taste as I didn’t feel it came through all that strong but others said it was perfectly malty for them so perhaps I simply don’t taste malty flavours so well. Either way, I liked these! They are deliciously soft and moist inside with a slight sugar crunch on the top. The chocolate buttercream lends an edge of sweetness to the soft, malty cake. – Heat the oven to gas mark 4 and prepare a 12 hole muffin tin with paper liners. – Cream together the butter and the sugars until soft and fluffy. – Gradually add the beaten egg a bit at a time, beating well until completely combined between additions. – Sift in the flour and Ovaltine then fold in until just combined. – Bake for 25 minutes, test for doneness with a skewer, if it comes out clean the cake is done. – Remove from the oven and cool completely on a wire rack. – Melt the chocolate over a pan of boiling water then allow to cool. – Add the vanilla extract and the melted chocolate. – Beat until glossy and smooth. 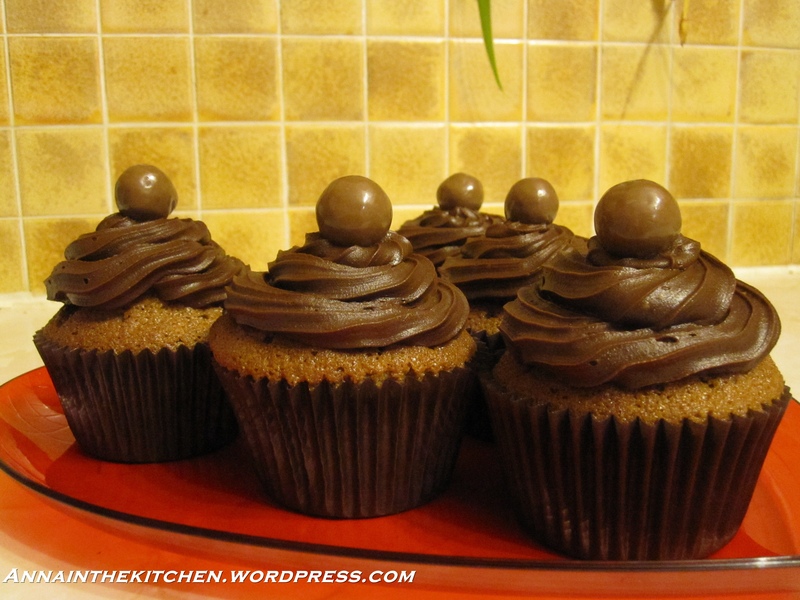 – Pipe or spread the buttercream onto the cakes then add a Malteaser to the top of each one. Enjoy!